We are very excited to welcome Alice’s Artisan Bakery to The Paddock, a new business based in Hexham, producing handmade, organic, artisan bread. Alice is a young entrepreneur who has been trained at the River Cottage Chef School in Devon and worked at the River Cottage Canteen in Winchester. Alice later worked for Allendale Bakery and learned how to bake ‘Real’, artisan bread in a wood fired oven. Alice has now moved to a bakery premises in Hexham that she shares with the Hextol Foundation where she continues to supply local and independent delis and tearooms and The Paddock is now lucky enough to be one of them! Alice’s bread is all baked with organic ingredients, slow proved and handcrafted to allow the flavour to develop. She is passionate about quality and uses local Gilchester’s flour and fresh yeasts or sourdough cultures. Being part of the Real Bread Campaign, you can be assured that Alice’s bread has no flavour enhancers or preservatives and it also freezes perfectly! Choose from Alice's selection of Sourdough's, Rye, Spelt and more - full list below and now available on our website to order through the drop down menu at the bottom of the page. Alice's bread will be available for a Thursday delivery only (sorry we will not be able to provide a Wednesday delivery at present). Alice's bread will be available to collect from our Farm Shop on a Thursday or Friday and select Saturday's. Some of Alice's loaves do contain milk and butter and will not be suitable for a vegan diet. Please check the ingredients when ordering. Please note, Alice uses plastic bags to wrap her bread. The Paddock has worked with Jo from Rise Bakery since the very beginning of our story to offer freshly baked, handmade bread as part of the weekly delivery service as well as within our Farm Shop. Jo hand-bakes each loaf with love and care in her home in Stocksfield using locally grown organic wheat flour, from Gilchester's Organics, which is traditionally stoneground by wind power in Northumberland. Jo then turns this beautiful organic flour into very tasty bread (I can vouch for it, I have tried it and it is delicious!!) With no additives, just flour, salt, yeast and water, it doesn't get much tastier, fresher or more local than this! Jo bakes her bread fresh for you on a Wednesday morning, to be delivered along with your order. Alternatively you can collect from the Farm Shop after 12pm on a Wednesday and Friday. Jo will be baking small and large, white and wholemeal loaves and a different weekly special, which could be anything from a seeded loaf, a fruit loaf to a soda bread. All of Jo's bread comes wrapped in brown paper. Special Loaves usually a mixture of 50/50 white and wholemeal organic flour and organic ingredients £2.80 - please contact Laura or visit the Facebook page or Farm Shop to find out the weekly special for the week. All of Jo's bread other than the soda bread's is suitable for those on a vegan diet. Both Jo and Alice bake their bread with Gilchester's organic, local flour. Situated 2 miles North of Hadrian's wall, deep in the heart of Northumberland is the North East’s only organic flour mill where they gently stone grind, rare breed grains into some of the finest flour you can lay your hands on. From seed to soil to stone grinding Gilchesters organics work with nature, milling only the grains they grow. At Gilchesters, on the site of a roman fort, they work with nature growing and milling heritage grains and rearing white Galloway rare-breed cattle to combine a balance between farming and wildlife conservation. The choice of heritage wheat grains as well as rye, spelt and even older Emmer and Einkorn cereals is the result of painstaking research into organic crop husbandry on the farm over the years. The organic farming methods allow them to produce the food people want in harmony with our surroundings. Modern farming production methods often ignore the fundamental principal of growing crops and livestock within the natural constraints of the land. All of our bread is hand baked in small batches. Orders for bread must be placed along with orders for fruit and/or veg and all your other goodies by Sunday evening at the latest to be received on the following Wednesday or Thursday. I'm sorry but we do not deliver bread alone. Please bare in mind if you receive your delivery on a Thursday, the bread will have been baked on a Wednesday. The bread will freeze. Alternatively, you can collect your bread from our Farm Shop on either a Wednesday or Friday from 12pm (for Jo's bread, Rise Bakery) or all day on a Thursday for Alice's bread - you may pre-order or just pop in and collect a loaf. If you wish to order a loaf to go alongside your veg box, please select your loaf from the drop down menu below. 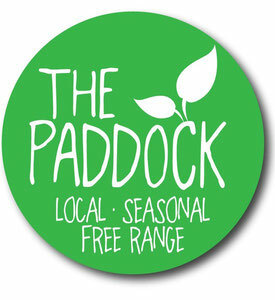 Alternatively, add your favourite loaf to your regular order by emailing laura@thepaddock.org.uk!